In the legal business, all of your data is highly sensitive. It is critical to safeguard both the confidentiality as well as the integrity of the information with which your firm has been entrusted. Attacks are commonly aimed at stealing sensitive data, such as high value merger and acquisition information, but can also be aimed at destroying or altering sensitive data critical to ongoing litigation. 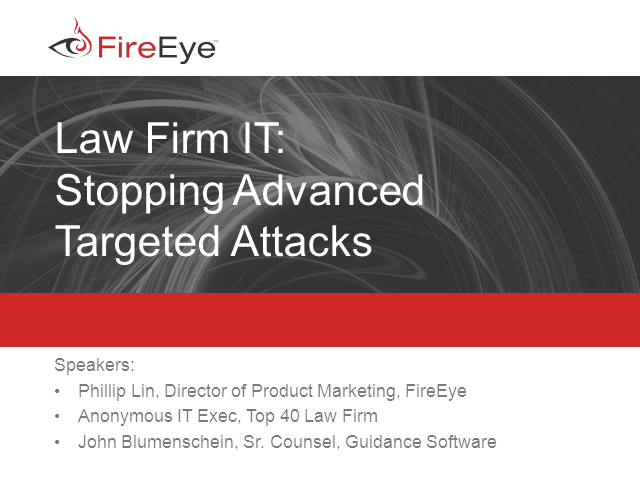 In addition, e-discovery exposes law firm networks to advanced malware embedded in the electronically stored information (ESI), such as e-mail, instant messaging chats, documents, databases, multimedia files, Web sites, and any other network objects. Today's cyber attackers use a variety to tactics to gain a foothold in the network to then stage a full-scale compromise. For example, they send an e-mail posing as a partner working on the deal, and in the email it includes attachments that contained malware as well as malicious URLs to deliver drive-by downloads of malware. After successfully infecting a system, cyber attackers will establish callback channels, download further malware binary payloads, and compromise even more sensitive systems to gain access to key documents and data.